Dr. William Thomas Pecora, Director of the USGS. Served from 1965-1971. Later served as Under Secretary of the Interior. Photo from 1965. Mar 28, 2016 • The William T. Pecora Award is presented annually to individuals or groups that have made outstanding contributions toward understanding the Earth by means of remote sensing. The Department of the Interior (DOI) and the National Aeronautics and Space Administration (NASA) jointly sponsor the award. The award was established in 1974 to honor the memory of Dr. William T. Pecora, former Director of the U.S. Geological Survey and Under Secretary, Department of the Interior. 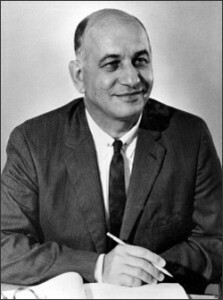 Dr. Pecora was a motivating force behind the establishment of a program for civil remote sensing of the Earth from space. His early vision and support helped establish what we know today as the Landsat satellite program. The Award Committee must receive nominations for the 2016 award by June 10, 2016. Instructions for preparing a nomination and other information about the award can be found on the Pecora Award website.